The GrandKids were wanting a new mural for their recently remodeled playroom. When they were little I could paint whatever I wanted and they’d be happy. Now they’re old enough to make specific requests. And I mean SPECIFIC. 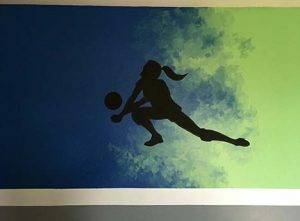 GrandDaughter wanted a volleyball player silhouette with the background melding from the blue of the walls to the green. GrandSon wanted game system logos with a digital looking transition. 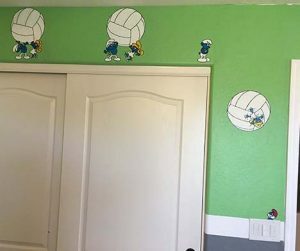 Then they decided they wanted additional smaller images around the room. GrandDaughter came up with a scenario. Hefty Smurf and Smurfette holding up a volleyball, phone rings, he answers, she can’t hold up the volleyball by herself. 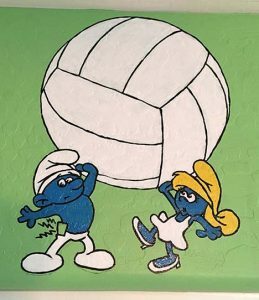 Meanwhile, Papa Smurf looks on. 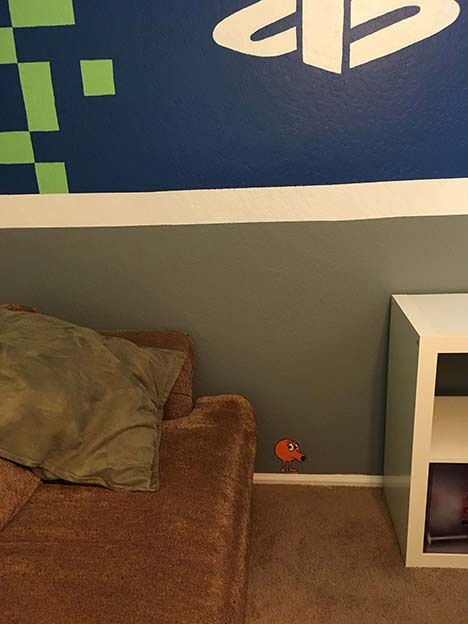 GrandSon wanted vintage video games scattered around: Pac-Man, Donkey Kong and Q*Bert. 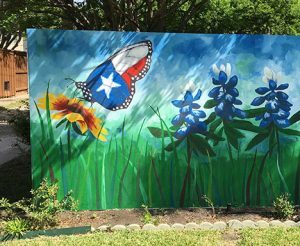 It took me a whole month but I finally completed a mural on my fence. I had lost some plants and when I removed them they exposed a very ugly fence. 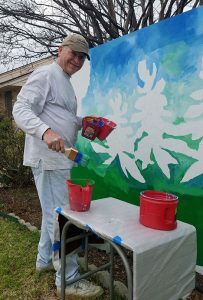 I decided instead of re-staining or painting it, I would paint a mural. 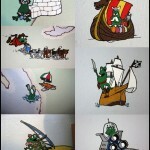 This is a computer line drawing from a photo taken of my son helping me do the “Frog Mural” for my first grandkid. I did the lines, my wife, my son and my daughter-in-law helped with the fill. 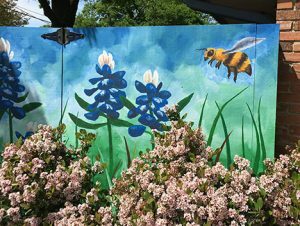 Nine years ago I painted a mural for a brand new baby boy. 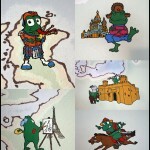 The theme was “Traveling Frogs,” or “Frogs Around The World,” or something like that. 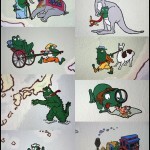 I painted the continents of the earth around the room on all the walls and placed frogs in various places doing relevant things in stereotypical attire. Well, that baby is a big boy now, has moved upstairs to a new room and his little sister has inherited the room and the frog mural. But, alas, most of the frogs were boy frogs. I needed to add some girl frogs. What’s the difference between a cartoon boy frog and a cartoon girl frog? Mostly eyelashes and lipstick. 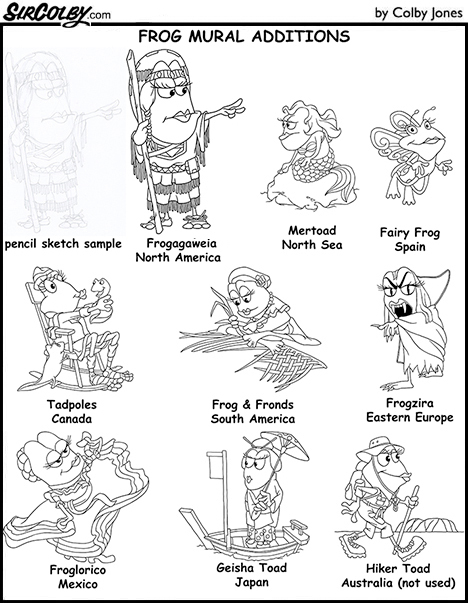 And, oh yeah, some kind of fairy frog was required. Sorry for the poor quality of the photos. 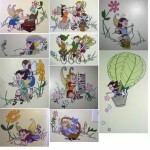 I recently posted a sampling of the planning stages for the fairy mural. 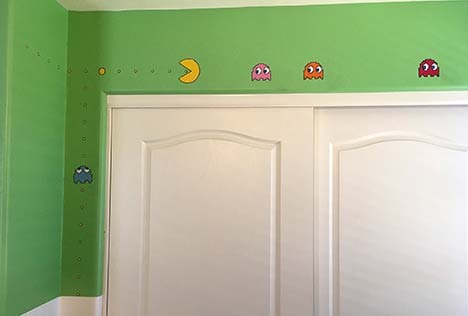 Now I’ll let you in on how it went to actually put it on the walls. 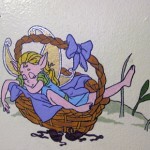 I’ll continue with the fairy restfully napping in the basket. 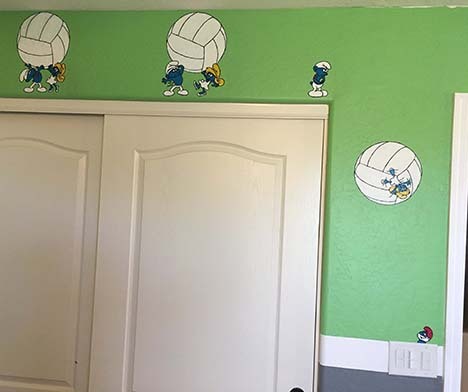 First, I printed the computer images and taped them to the wall where I thought they might go. It seemed fitting that the napping fairy go next to the light switch. Another fairy reading a book went near a book shelf, and so on. 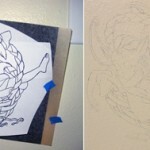 Once all the images were where I wanted them I put carbon paper behind them and traced them onto the wall. 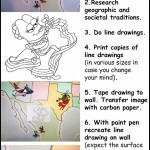 Next, I used a paint pen to draw the lines. I actually spent too much time doing this since many of the lines would be obscured when doing the coloring and I would need to go over them again anyway. I could have been more judicious of what to draw or what to leave until later. To tie the scenes together around the room I created a “horizon” that led to the next drawing and added some leaves of grass. The flowers are not random; they match flowers in nearby room accessories such as drapes, wall hangings, etc. Finally, with the color added I went back and enhanced the lines. 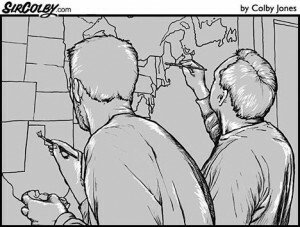 All that was left was a little touch up and eliminating excess pencil lines, etc. 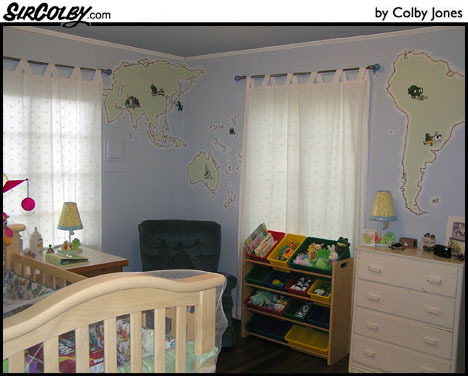 I’m in the planning stages of painting a mural in a baby’s room. The parents are expecting a girl and want the theme of the mural to be fairies. 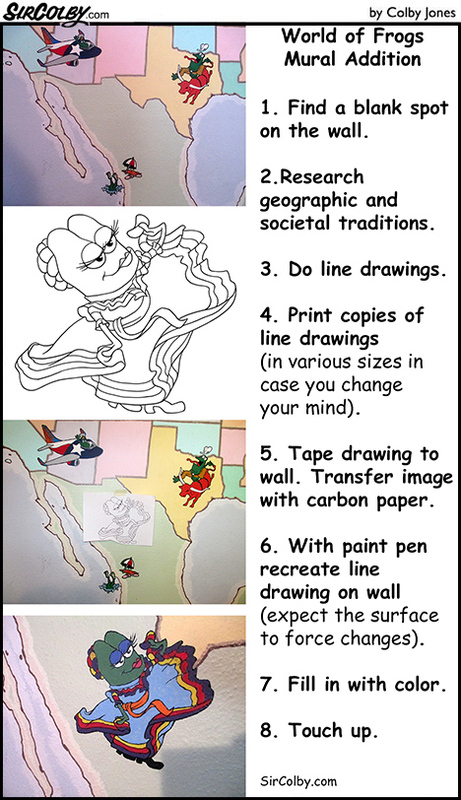 I’ve already made several drawings that we’ll use on the wall. For this drawing I thought I’d share some of the process with you. In the other drawings the fairies are actively doing a variety of things. I thought they needed a rest so I drew a fairy sleeping. This might come in handy some day during the it’s-time-to-take-a-nap battle. First an explanation of the four thumbnails, from left to right. I did a quick search of the internet and Tinkerbell inspired me to switch from a tranquil slumber to one with her legs and arms hanging out of the basket. An even quicker search came up with a basket I liked which I altered to something that looked more like what a fairy would take a nap in. I put a blank piece of paper over my pencil-drawn basket and drew my fairy sound asleep, shoes tossed aside. I drew the basket and the napping fairy separately because I didn’t want to have to keep re-drawing the basket whenever I didn’t like something with the fairy. Lastly, I scanned my pencil drawings of the basket and the fairy into Photoshop, created a new layer and drew the “ink” version on the computer. 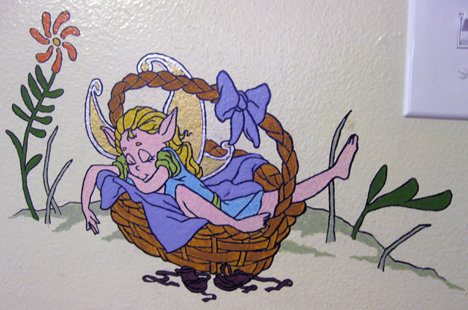 When she finally gets onto the wall the snoozing fairy will be in color. Asia and Africa are on the same wall but separated by a window. Oceania and South America are on the same wall but also separated by a window. This view tries to get Asia, Oceania and South America all in one photo. A frog in India tames an elephant. In China a frog pulls a rickshaw. 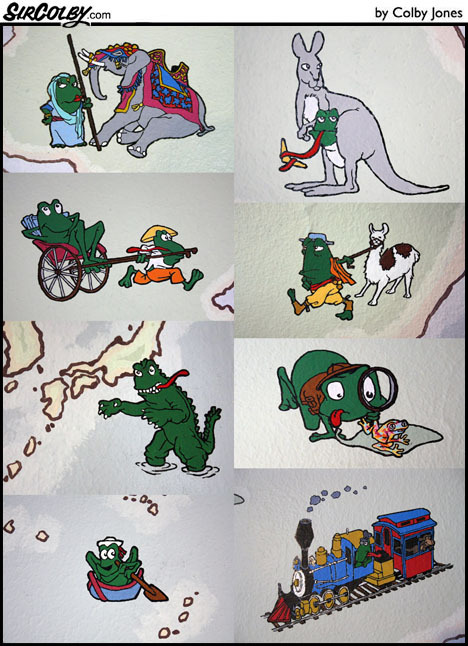 Frogzilla rampages off the coast of Japan while a sailor frog tours the islands. An Australian frog finds comfort in a kangaroo. 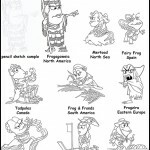 Over in South America a frog studies the critters of the rainforest and a gaucho tugs at a llama. The old steam train was added later and includes a monkey passenger, a nod to the Monkey Mural. 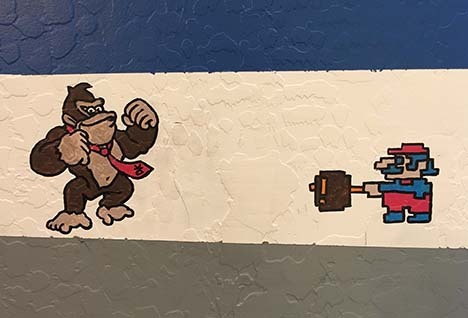 The photos of the mural showing Europe and Africa are actually of two separate walls. The Africa and Asia murals are on the same wall but separated by a window so it’s easier to show them this way. 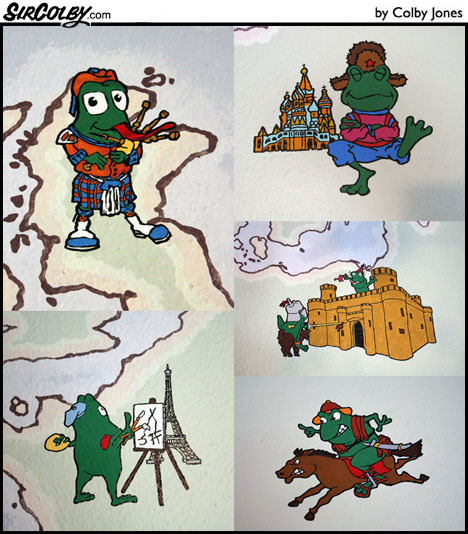 The European frogs include a Scotsman playing the pipes, an artist in France, a dancing Russian, a damsel-saving knight and, giving a nod to my ancestors, Attila the Frog. OK, the hot air balloon doesn’t have much to do with Africa. It just seemed that something needed to be floating there. 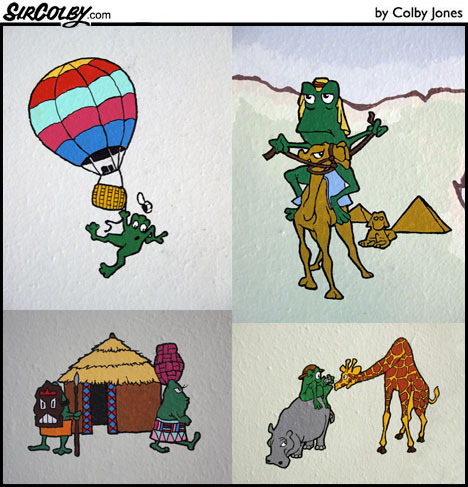 The frogs in African ride a camel in Egypt, go on a photo-safari and live in a quaint village. By request I had previously offered up some closer views of the various monkeys in the Monkey Mural. So, now I’ll do the same for the Traveling Frogs Mural. The frogs are a lot smaller in scale than the monkeys are. The mural covers all four walls. 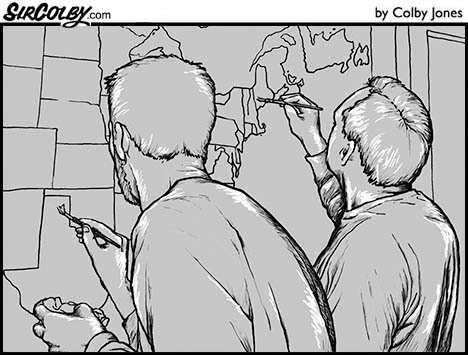 The largest painting is that of North America. 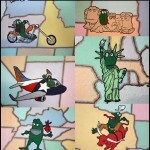 There are too many frogs so I split them into two groups; those in the 48 contiguous states and those who aren’t (sorry, Hawaii and Alaska). 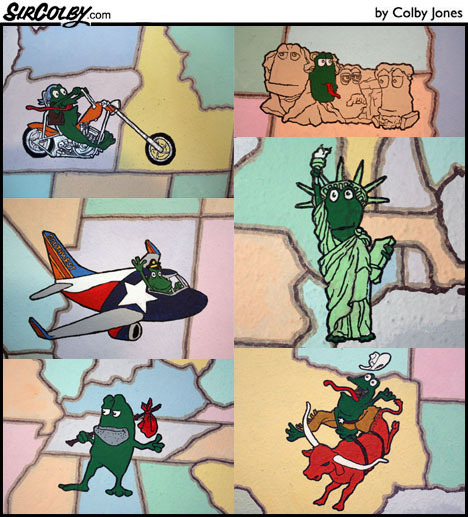 The US frogs include a biker in the northwest, a Southwest pilot in Arizona, a hobo hitch-hiking across the south, frogs immortalized within Mount Rushmore and the Statue of Liberty and a bull-riding cowboy in Texas. The other frogs on this wall include an Eskimo emerging from an igloo, a dog-sledding Mountie, one enjoying the Pacific coast of Mexico and a hula-clad windsurfer. 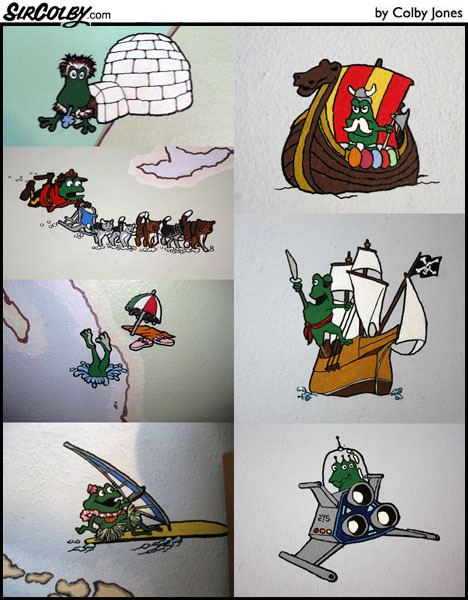 A Viking explores from the adjacent wall, a pirate trolls the Caribbean and, just of the heckuvit, an Alien frog hides behind the door.